Details of the Weekly Challenges, the Chapter Rank, and what you’ll earn by playing. A Few Good Soldiers (Week 1 – 2): On January 17, the first Chapter Event of Chapter 2: Lightning Strikes kicks off. Its two Weekly Challenges will focus on the intense 8-vs-8 matches of Squad Conquest – a guest-starring mode available for a limited time during the second Chapter. Complete them to unlock the Zk-383 submachine gun and the Modele 1944 semi-automatic rifle. Hold the Line (Week 3 – 4): Themed around the Breakthrough and Frontlines, Hold the Line challenges you to learn and master these game modes in two new Weekly Challenges. There’s rockin’ Final Countdown headgear and a powerful M1922 MMG in it for you if you succeed. Iron Skin (Week 5): Tank warfare is a prominent theme in Chapter 2: Lightning Strikes and the one-week Chapter Event of Iron Skin celebrates the steel beasts of Battlefield V. Stay tuned for more details on challenges and rewards. Armor on the Horizon (Week 6 – 7): The crown jewel of Battlefield V multiplayer, Grand Operations combines maps and modes in an epic blend of multiplayer goodness. A Grand Operation is added with Chapter 2, and you’ll be taking on two Weekly Challenges tied to this in the Armor on the Horizon Chapter Event. We’ll share details on rewards and more in an upcoming article. 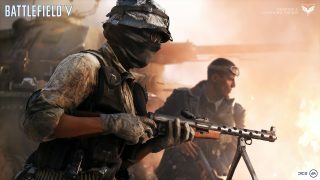 Unstoppable Force (Week 8 – 9): Rush returns during Chapter 2: Lightning Strikes, and this classic mode in a new veil – highly anticipated by Battlefield veterans – is the focus of the Chapter Event dubbed Unstoppable Force. We’re laying the final touches on this Chapter Event, its Weekly Challenges, and their superb rewards – we can’t wait to tell you more about them! There’s more! During Chapter 2: Lightning Strikes, there are big chunks of XP to be earned through chapter-specific Special Assignments. Just like regular Special Assignments, these are sets of mini-challenges where you can earn rewards by completing a set number of tasks. Simply head to the main menu’s Assignments section and choose up to four of these to be tracked simultaneously. Below are the Special Assignments you’ll be able to tackle (only) in Chapter 2. Jump into Battlefield V to see exact requirements and rewards for each task. Kill a set number of enemies. Kill a set number of enemies in one round. Play a set number of rounds in any game mode. Win a set number of rounds in any game mode. Capture a set number of objectives. Capture a set number of objectives in a round. Kill a set number of vehicles while in a vehicle. Destroy a set number of enemy vehicles. Kill a set number of enemies while in an objective area. Kill a set number of enemies in one life. Kill a set number of enemies while in a vehicle in one round. Destroy a set number of enemy vehicles in one round. Kill a set number of enemies while in an objective area in one life. Destroy a set number of enemy vehicles in a round. Enjoy your multiplayer adventures in Chapter 2: Lightning Strikes. There is lots to be conquered and lots to earn. More is coming with the further updates of the Chapter, so stay tuned – and good luck!